One thing about Grand Canyon views: They seldom disappoint. Even gray spring weather is a reliable precursor to something beautiful. So, after a long day of drizzly rain that eventually turned to snow, I went to bed on April 25th knowing that the morning sky would be putting on a show. And indeed it did. From Hopi Point, an isolated blanket of clouds could be seen lingering at eye level above the North Rim drainages. As the clouds broke up, they cast beautiful shadows across the landscape. The cloud cover was more extensive earlier in the morning. Grand Canyon interpretive ranger Erin Whittaker posted this photo to the park’s Facebook page, showing a low ceiling of clouds hovering just above Mather Point. If the rain had fallen a few months earlier, and if it had been followed by a clear day with low wind, it would have been a perfect recipe for an atmospheric inversion. 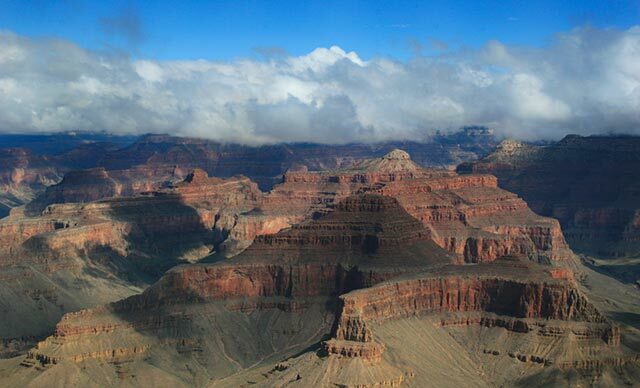 During these rare events, Grand Canyon may be filled from rim to rim with what looks like a river of clouds. Today, the air was too unstable and the inner canyon too warm to result in an inversion. But it nevertheless inspired me to write about the subject. Over the past two winters, Grand Canyon has seen several of these beautiful inversions. These photogenic events reliably make national news. But what are they? The word “inversion” isn’t specific to Grand Canyon — it actually describes a general meteorological phenomenon. Typically, if you were to ascend through the atmosphere on a balloon, you would feel the temperature continually drop as you soared ever higher. Not so during an inversion. Ascending through an inversion, you would feel it get colder and colder, until suddenly the temperature increased. Then, after you passed by that inversion point, the air would again continue to cool. Inversions take place all over the world. They’re the things that trap smog over big cities. And not far from the Grand Canyon, they happen on a near-nightly basis in many Rocky Mountain valleys. Indeed, the entire Colorado Plateau, which is ringed with mountains, is sometimes home to what meteorologists call “synoptic-scale” (really big) inversions. Because inversions are defined by atmospheric temperature and not puffy clouds, they aren’t necessarily visible to the naked eye. But even invisible (cloudless, temperature-only) inversions are rare at Grand Canyon. In fact, their infrequency is remarkable in and of itself, and has been the subject of scientific study. If the canyon is shaped sort of like a giant valley, and if mountain valleys regularly experience atmospheric inversions, it seems to follow that inversions should also be common at the canyon. Various hypotheses have been proposed to explain why this is not so. One plausible story is that cold air descending from the Kaibab Plateau — more than 9,000 feet above sea level at its highest point — usually results in sufficient atmospheric mixing to make an inversion layer impossible. Every once in a while, though, a total cloud inversion does happen. They happen in the winter, when long nights provide extra time for the inner canyon to really cool down. Then, when a warm air mass passes over the cold inner-canyon, Grand Canyon gets a temperature inversion. But there’s one more ingredient that’s necessary to fill the canyon with clouds: Water vapor. When a temperature inversion follows a precipitation event, water vapor gets trapped by the inversion, forming clouds. So, during the wet weather leading up to the inversion, Grand Canyon is actually acting as a giant “capacitor” for cloud formation. Stand on the rim during an inversion and you’ll hear murmured appreciation punctuated by the occasional grouchy visitor. “We drove ten hours for this? I can’t even see the bottom.” Of course, Captain Sourgrapes is oblivious to what the inversion shows off. In the photo above, you can see how the clouds act like a giant carpenter’s level, revealing the slight angle of the Kaibab Plateau. That slight angle means that the North Rim is about one thousand feet higher than the South Rim. This seemingly minor detail has had a profound effect on Grand Canyon’s geography and ecology. 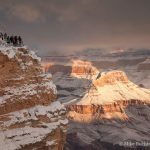 Because of its elevation, the North Rim enjoys more precipitation, cooler weather, and a climate more typically encountered at higher latitudes. In fact, some of the tree species found in North Rim forests are commonplace in Canada. More precipitation on the North Rim means more water to carve the canyon. And the incline of the plateau means that precipitation on the North Rim drains directly into the canyon. The South Rim is drier, and precipitation on the plateau drains away from the canyon. Hence there’s more erosion on the north side of the river than the south. The North Rim is about twice as far away from the river by trail as is the South Rim. If our hypothetical grouchy tourist were the lucky recipient of an attitude adjustment, he might choose to enjoy this sublime view for more than a couple minutes. In so doing, he would notice something else that the inversion makes visible: The currents of air flowing through Grand Canyon like a river. If you were somehow able to view the inversion from outer space, you would see that it makes something else visible: The shape of Grand Canyon. That river of clouds, seen from above, clearly delineates the boundary between plateau and canyon. 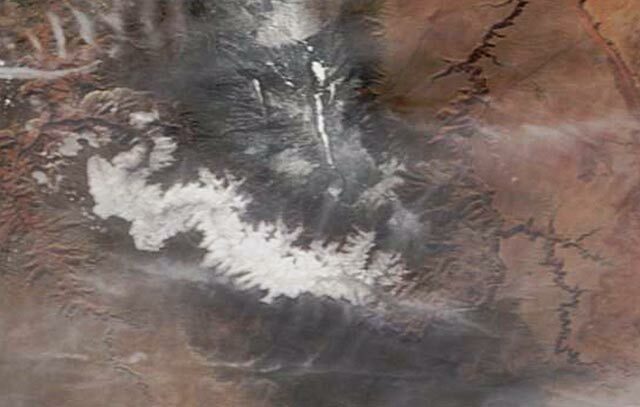 The above photo is a satellite image of this year’s January 28th inversion. Beneath a translucent layer of high-altitude clouds, you can see the solid-white inversion layer stretching across the canyon from Great Thumb Mesa to the Clear Creek drainage. Marble Canyon and the Little Colorado River Gorge are visible on the right. In the top of the picture, you can see a dusting of snow on the North Kaibab Plateau. But it gets even better. This NASA animation from 2013 shows how the inversion appears to “breathe” over successive days, with cloud cover expanding overnight and contracting during the day. Back on solid ground, another form of ebb and flow is visible on a shorter timescale. This time-lapse video shows how inversion clouds wash against the canyon rim like a rising and falling tide. All in all, it’s a beautiful spectacle. Mike Campbell leads guided day hikes in Grand Canyon National Park. 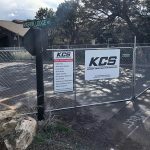 He is the owner of Canyonology Treks, and has written about the canyon for Hit the Trail, Grand Canyon Association’s Canyon Views, and on his company website.